The United Nations Volunteers (UNV) programme and UN Population Fund (UNFPA) are partnering on a Young Innovators Fellowship Programme for 2019. This programme will provide young people (aged 18-29) with the opportunity to engage in a structured programme to drive innovation, creativity and to deliver concrete results in UNFPA. UN Volunteer Bakoko Matua Joyce (Uganda), has been supporting UNFPA’s Rohingya Humanitarian Response in Cox’s Bazar since early 2018. 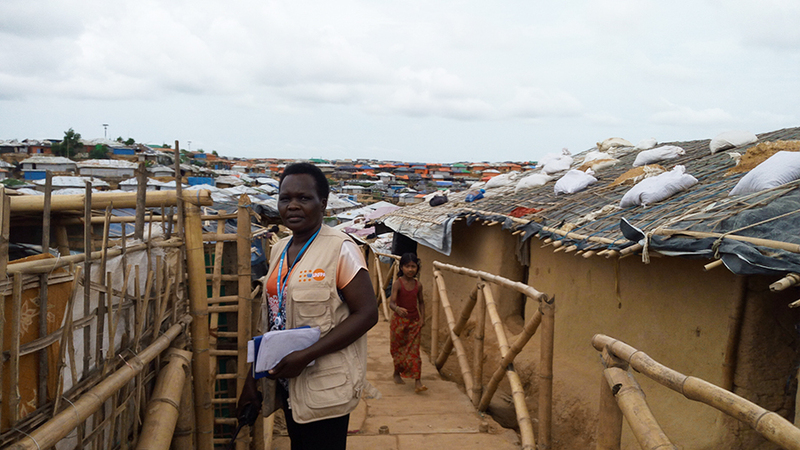 Here, Bakoko is on her way to a UNFPA-supported facility that is difficult to access. Enabling young people to realize their full social, economic and human potential is a key aspect of this UNV-UNFPA partnership. The fellowship programme provides an opportunity to bring 14 young people into UNFPA with a dedicated focus on both providing a youth perspective and driving innovation. Selected fellows would join UNFPA headquarters in New York for two months, where they would undergo a dedicated leadership training. Two of the Young Innovators will remain as international UN Volunteers for a further six months at UNFPA headquarters in New York; these two HQ positions are open to applicants of all nationalities. The other 12 Young Innovators will return to their home countries, where they will complete six-month national UN Volunteer assignments in UNFPA Country Offices (and must be nationals of these countries). We will recruit innovative young people from around the world who have demonstrated commitment to development issues within their communities as UN Volunteer Young Innovators. Our goal is to provide these UN Volunteer Young Innovators with the tools, skill sets, international experience and exposure to innovation to empower them to realize their career goals, thus building national capacity. Fellows in turn provide innovative insights and ideas that will enable UNFPA to be better aligned with development issues in their community. Special consideration will be given to indigenous people, people with disabilities, LGBTQI candidates and other marginalized groups. UNFPA is the United Nations sexual and reproductive health agency. Our mission is to deliver a world where every pregnancy is wanted, every childbirth is safe and every young person's potential is fulfilled. UNFPA’s goal is to achieve universal access to sexual and reproductive health, realize reproductive rights, and reduce maternal mortality to accelerate progress on the ICPD agenda, to improve the lives of adolescents and youth, and women, enabled by population dynamics, human rights, and gender equality. UNV is the UN organization that promotes volunteerism to support peace and development worldwide. Volunteerism can transform the pace and nature of development and it benefits both society at large and the individual volunteer. UNV contributes to peace and development by advocating for volunteerism globally, encouraging partners to integrate volunteerism into development programming, and mobilizing volunteers.